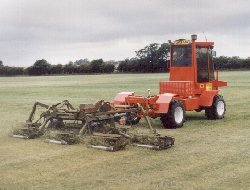 The summer development project in1989 was concerned with increasing the versatility of the Agribuggy for use in the industrial and amenity sectors. Much of the work was centred on the development of a higher powered power take-off system and drawbar unit to enable the Agribuggy to tow gang mowers. The work was carried out using a 7 gang, 15ft mower on newly sown and established turf grown by Rolawn Turf Growers in Yorkshire. Field trials were very successfull and a machine was supplied to them to replace a compact tractor. It is used mainly for the mowing of newly sown turf but will also carries a fertiliser spreader for top-dressing in the spring and autumn. The Agribuggy can provide the complete solution to your turf care needs. The lightweight and low ground pressure ensures that damage and compaction is kept to an absolute minimum whatever the conditions under-foot - The ground pressure, when fitted with 15" turf tyres is as little as 4 psi or less than that of a mans feet! Sprayers and fertiliser spreaders can be supplied, if required, tailored to your exact requirements. These demountable units are bolted directly to the chassis and can be interchanged with ease. Alternatively various demountable pick-up type bodies can also be supplied so that the Agribuggy can also be used as a general purpose transport vehicle with a 1 tonne payload.. For gang-mowing there is the further option of the drawbar and rear mounted PTO system. This system will develop up to 15HP and is capable of towing a 15ft gang mower at speeds from 4 to 10 mph depending on crop conditions. The high road speed and all-round suspension ensure a comfortable ride for the operator and quick movement from job to job.